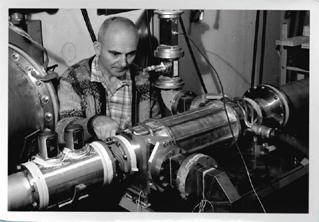 The 1940s saw the origins of linear electron accelerators that directly led to the 2-mile-long accelerator at Stanford Linear Accelerator Center. SLAC archivist Jean Deken presents a pictorial history of early linear accelerator development at Stanford University. 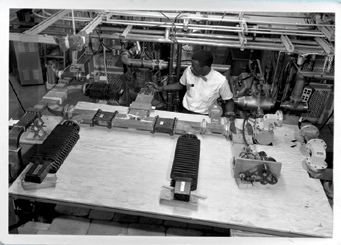 The images show a series of accelerators called Mark I-IV. "When Bill Hansen invented the electromagnetic resonant cavity before the war, he was interested in generating high voltages for particle accelerators with relatively modest inputs of power... Following his war work in the east, Hansen returned to Stanford to refocus his microwave efforts on a linear accelerator with the objective of obtaining high particle energies for fundamental physics. At the same time, work on linear accelerators related to protons rather than electrons was started in Berkeley by Luis Alvarez and his associates, of whom I [W.K.H. "Pief" Panofsky] was one. In the late 1940s, that proton accelerator was a much larger device than Hansen's electron machines at Stanford because, for technical reasons, a frequency 15 times lower was chosen for its operation. In one memorable photo [below right], Alvarez and his associates were seen sitting on the vacuum tank of their machine. 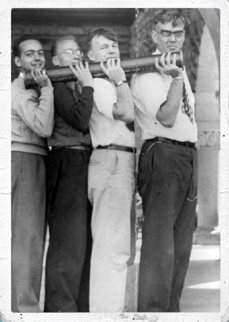 When he learned of this photograph, Hansen demonstrated [below] that he could carry his machine, the Mark I linear accelerator, on his shoulder!" W.K.H. Panofsky, "Big Physics and Small Physics at Stanford," Sandstone & Tile, Summer 1990. A "contract between the Office of Naval Research and Stanford University, calling for work leading to a billion-volt electron linear accelerator, went into effect June 1948...[W]ork was carried out in several areas. The theory of microwave electron linear accelerators was studied and advanced. Investigation was carried out of various accelerator structures to determine which were most suitable for electron acceleration...Microwave measuring techniques were developed for testing accelerator components. Further research into the accelerator principle was carried out on the magnetron powered Mark I 6-MeV accelerator. Design, development, and construction of the high-power klystron amplifier were intensified in order to be able to provide the necessary traveling waves for the large accelerator. The modulating devices for pulsing the klystrons on and off were developed. Components for the large accelerator were designed and fabricated. The prototype Mark II accelerator was operated with the new components, including the new high-power klystron. Construction of the large accelerator, now known as the Mark III, was begun. "The Mark III first operated on the night of November 30, 1950. 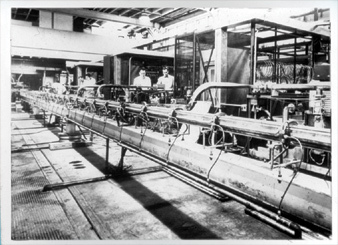 At that time, a length of 30 feet of accelerator was assembled, supplied by three klystrons. With each klystron providing an average of eight megawatts of microwave power, this operation delivered an electron beam of about 75 MeV." "In 1954, with U.S. Atomic Energy Commission support, Stanford started to build a 20-foot, 80 MeV research accelerator. 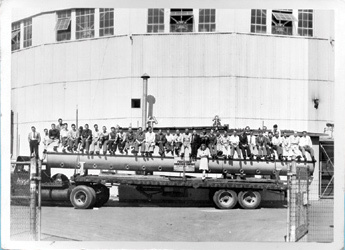 This machine, which became known as the Mark IV, was designed...to study methods of improving accelerator components...In the early 1960s, the Mark IV was used extensively as a prototype for the [SLAC] two-mile accelerator, and for testing some of its components."